They say that when you're upset with someone, it sometimes helps to put your feelings down in a letter, wait a day for your mood to calm down and then decide if you want to send it. What most people don't know is that this advice can be slightly modified: If you're upset with someone, write it down and then turn whatever you wrote into a gigantic billboard that whoever you're mad at will have to drive past every day on their way to work. Hey, we all have our coping mechanisms. GPS tracker — $250, Nikon camera with zoom lens — $1600, Catching my LYING HUSBAND and buying this billboard with our investment account - Priceless. 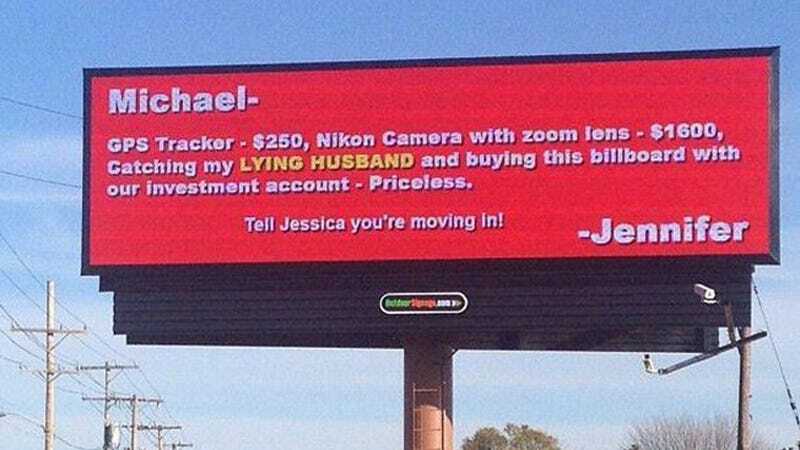 Tell Jessica you're moving in! Sure, it's a little derivative, but revenge, not creativity, is Jennifer's strong suit. Also: a GPS tracker and a Nikon camera with a zoom lens? Do you think this lady donated to the Veronica Mars Kickstarter?